Managing your time in college is a huge part of becoming successful. Developing good time management skills early on will help you to balance your work, school and social activities while managing your stress level in the process. There is nothing worse than having too much to do and waiting until the last minute to try and finish everything. 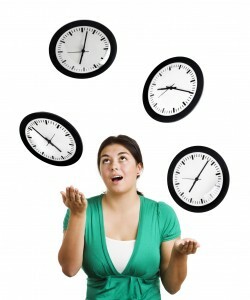 Here are some tips to help you create a time balance in your college life. This may sound obvious to some but use a calendar. It could be a paper calendar or an online calendar as long as it works for you. A calendar can help you remember important dates, keep information in one place and help you to plan out your days. Google Calendar helps you keep organized and allows you to keep appointments, important events, test dates and assignment due dates all in one place. Google will send you an e-mail and/or text message reminder and you can access your calendar anytime. This means not taking on too many higher level classes if you feel that you cannot handle the work load. If you are not strong in Math or Science, then don’t take too many math or science classes together in one semester. Know that you will have to devote more study time and possibly lab time to those classes. Saying no is not a dirty word. You have the right to say no to people. If people ask you to do something whether it is go to a party, help them move, drive them around. and you know that you will be stressed out or miss out much needed study time as a result then try to only commit to activities and events that you know you can handle. This is not to say don’t go to parties or help your friends but know that you will have to make decisions about what you can and cannot do. Create a Study Schedule That Works For You! Everyone is different. Some are morning people, some are not. Some are able to study better in groups while some do not. You will need to try different study techniques to see what works for you. Procrastination Is An Ugly Word! Whether you realize it or not, procrastination can severely damage your grades and academic success. Procrastinating forces you to create lower quality work, increases your stress, lowers your grades and hurts your reputation among teachers and classmates. Get into the habit of starting projects and papers early and you will increase your grades and lower your stress. Break Larger Papers and Projects Into Sections. If you have an extensive paper or project to do, break the work load into sections. This will ease your stress and possibly make it enjoyable at times. Allow Yourself Time For Breaks and Activities You Enjoy. A huge part of staying healthy and sane during your college years is to laugh, smile and enjoy yourself. If you make time for the things you love, even if it just for a little while, you will end up a happier and more well-adjusted person.